Brie Anne Eichhorn remembers the conversation that changed her life. “I thought I was too cool. I wasn’t all-in,” Eichhorn recalls. Still, a seed had been planted, and it began to grow as Eichhorn took a deeper look at her life. Finding it lacking in the fulfillment and the faith she wanted, she decided to consider her mom’s suggestion. 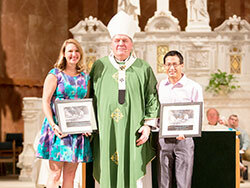 It was the beginning of a transformation for her, a change that was recently celebrated when she was chosen as one of the two recipients of this year’s archdiocesan Young Adult Servant Leader of the Year Award. 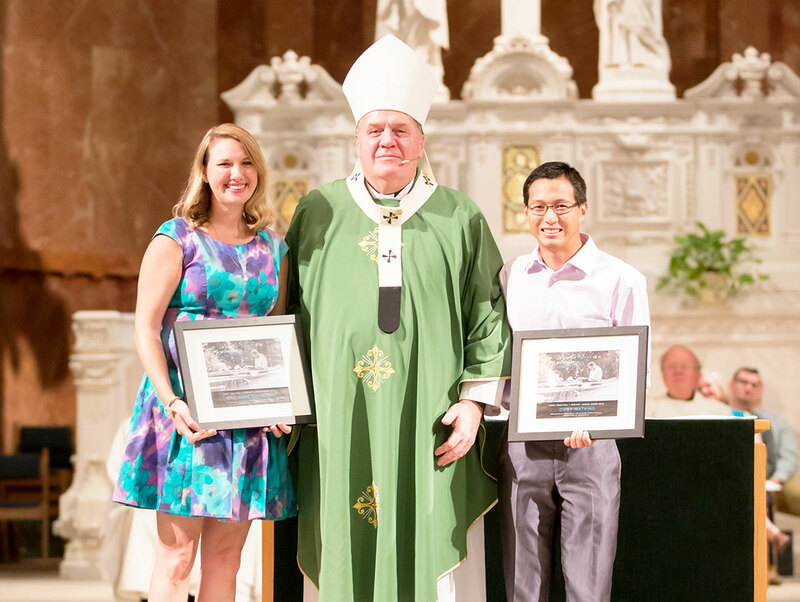 Eichhorn and Cory Watkins received the award during the “Bishop’s Bash” that Archbishop Joseph W. Tobin hosted for young adults in Indianapolis on Sept. 25. She began her involvement in the young adult faith community by sharing her talent and passion for music. She also became involved in leading retreats. And her background as a registered nurse who teaches natural family planning has led her to also teach St. John Paul II’s approach to sexuality—known as the theology of the body—to other young adults. For the past four years, she has also lived in the St. Catherine of Alexandria Women’s Formation House in Indianapolis, a community that strives to deepen their faith through living and praying together. Sometimes, that happens with a mother’s help. Eichhorn thought of her mother—Dr. Melanie Margiotta Linehan—when she received her Young Adult Servant Leader of the Year award. Her mother died last November. Creating relationships among young adults—and having them develop a closer relationship with God—has also been a growing focus for Cory Watkins in recent years. At 32, Watkins is a founding team member of Indy Catholic Young Adult Intramurals, a groundbreaking program in the archdiocese. Started in 2014, the program’s emphasis on sports and friendship has been successful in creating a sense of community and a connection to the Catholic faith for young adults. “I love that we can be competitive, that we can have fun, and that we can share our faith with each other before, during and after competition,” says Watkins, a member of Nativity of Our Lord Jesus Christ Parish in Indianapolis. In its third year, the program has connected more than 600 young adults from more than 40 parishes through the sports of volleyball, kickball and bowling. “You get to know a lot more people this way,” says Watkins, a graduate of Roncalli High School in Indianapolis. “It’s not the south side, the north side, the east side or the west side. We get to be meshed into one big group. People want to hang out and be together. Still, the best part for Watkins is the impact the intramurals program has had on his faith and the faith of other young adult Catholics from ages 18 to 35.